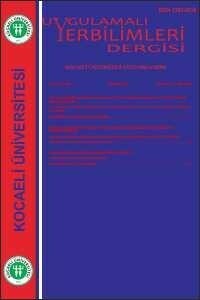 En önemli doğal afetlerden birisi olan heyelanlar, can ve mal kayıplarına neden olan çok yaygın bir kütle hareketi çeşididir. Heyelanlar karmaşık bir yapıya sahiptir. Bu nedenle heyelan problemlerinin çözümü kolay değildir. Bir yamacın heyelan tehlikesinin belirlenebilmesi için detaylı araştırmalara ihtiyaç vardır. Bunun için birçok teknikten oluşan çok disiplinli, bütünleşik bir çalışma gereklidir. Bu makalede son yıllarda heyelan araştırmalarında kullanımı giderek artan jeofizik yöntemlerin genel olarak heyelan araştırmalarında nasıl kullanılacağı açıklanarak bazı heyelanlarda gerçekleştirilmiş jeofizik uygulama örnekleri verilmektedir. Landslides, one of the most important natural disasters, are a very common type of mass movement that causes loss of life and property. Landslides have a complex structure. For this reason, it is not easy to solve landslide problems. Detailed research is needed to determine the hazard of landslide on a slope. This requires an integrated and multidisciplinary investigation. Geophysical applications provide a lot of data about landslides. In this article, the use of geophysical methods, which are increasingly used in landslide investigations in recent years, has been explained by giving examples of geophysical applications realized in some landslides. Barnhardt W.A. and Kayen R.E., 2000. Radar structure of earthquake induced coastal landslides in Anchorage, Alaska. Env. Geos., 7, 38-45. Batayneh A.T. and Al Diabat A.A., 2002. Application of a 2-D electrical tomography technique for investigating landslides along the Amman-Dead Sera Highway, Jordan. Env. Geology. 42, 399-403. Bichler A., Bobrowsky P., Best M., Douma M., Hunter J., Calvert T. and Burns R., 2004. Three-dimensional mapping of a landslide using a multi-geophysical approach: the Quesnel Forks landslide. Landslides 1, 29-40. Bièvre G., Jongmans D., Winiarski T., et al., 2012. Application of geophysical measurements for assessing the role of fissures in water infiltration within a clay landslide (Trieves area, French Alps), Hydrol. Process, 26, 2128–2142. Bogoslovsky V.A. and Ogilvy A.A., 1977. Geophysical methods for the investigation of landslides. Geophysics 42, 562-571. Bruno F. and Marillier F., 2000. Test of high-resolution seismic reflection and other geophysical techniques on the Boup landslide in the Swiss Alps. Survey in Geophysics 21, 333-348. Bouillon A.L., 2005. Geophysics for geohazards on land: state-of-the-art, case studies and education. ICG Report No. 2005-T1-1; NGI Report No. 20051108- 1, International Centre for Geohazards, Norwegian Geotechnical Institute, Oslo. Caris J.P.T. and Van Asch W.J., 1991. Geophysical, geotechnical and hydrological investigations of a small landslide in the French Alps. Eng. Geology 31, 249-276. Chambers J.E., Wilkinson P.B., Kuras O., Ford J.R., Gunn D.A., Meldrum P., Pennington C.V.L., Weller A.L., Hobbs P.R.N., Ogilvy, R.D., 2011. Three-dimensional geophysical anatomy of an active landslide in Lias Group mudrocks, Cleveland Basin, UK. Geomorphology 125: 472-484. Cruden D.M. and Varnes D.J., 1996. Landslide types and processes. In:Landslides investigation and mitigation, Transportation Research Board, Special Report 247. National Academy of Sciences, Washington DC., USA, 36-75. Cummings D., Clark BR., 1998. Use of seismic refraction and electrical resistivity surveys in landslide investigations, Bulletin of the Association of Engineering Geologists, 25(4), 459-464. Demoilin A., Pissart A. and Schroeder C., 2003. On the origin of late Quaternary palaeolandslides in the Liège (E Belgium) area. Int. J. Earth Sci. (Geol Rundsch), 92, 795-805. Epada P.D., Sylvestre G., Tabod, T.C., 2012. Geophysical and geotechnical investigations of a landslide in Kekem area, western Cameroon. Int. J. Geosci. 3, 780–789. Jongmans D. and Garambois S., 2007. Geophysical investigation of landslides: a review, Bull. Soc. géol. Fr., 2007, t. 178, no 2, pp. 101-112. Ferrucci F., Amelio M., Sorriso V. and Tansi C., 2000. Seismic prospecting of a slope affected by deep-seated gravitational slope deformation: the Lago Sackung, Calabria, Italy. Engineering Geology 57, 53-64. Frashëri, A., Liço, R., and Kapedani, N., 1999. An outlook on the influence of geological structures in geothermal regime in Albania: Albanian Journal of Natural and Technical Sciences, Acad. Sci. of Albania, 1, 129-139. Friedel S., Thielen A., Springman S.M., 2006. Investigation of a slope endangered by rainfall-induced landslides using 3D resistivity tomography and geotechnical testing. Journal of Applied Geophysics 60: 100-114. Gallipoli M., Lapenna V., Lorenzo P., Muccarelli M., Perrone A., Piscitelli S. and Sdao F., 2000. Comparison of geological and geophysical prospecting techniques in the study of a landslide in southern Italy. European Journal of Environmental and Engineering Geophysics 4, 117-128. Gelişli K., Çınar H., 1991. Heyelan araştırmalarında jeofizik yöntemlerin kullanımı. Türkiye 1. Ulusal heyelan sempozyumu, Trabzon-Türkiye, 27-29 Kasım 1991, 356-365. Gelişli K. and Ersoy H., 2017. Landslide investigation with the use of geophysical methods: a case study in northeastern Turkey. Advances in Biology & Earth Sciences Vol.2, No.1, pp.52-64. Glade T., Stark P. and Dikau R., 2005. Determination of potential landslide shear plane depth using seismic refraction. A case study in rheinhessen, Germany. Bull. Eng. Geology Env. 64, 151-158. Godio A., Strobbia C., De Bacco G., 2006. Geophysical characterization of a rockslide in an alpine region, Engineering Geology, 83, 273–286. Grandjean G., Gourry J.C., Sanchez O., Bitri A., Garambois S., 2011. Structural study of the Ballandaz landslide (French Alps) using geophysical imagery. Journal of Applied Geophysics 75: 531-542. Hack R., 2000. Geophysics for slope stability. Survey in Geophysics 21, 423-448. Havenith H.B., Jongmans D., Abdrakmatov K., Trefois P., Delvaux D. and Torgoev A., 2000. Geophysical investigations on seismically induced surface effects, case study of a landslide in the Suusamyr valley, Kyrgyzstan. Survey in Geophysics 21, 349-369. Israil M., Pachauri A.K., 2003. Geophysical characterization of a landslide site in the Himalayan foothill region, Journal of Asian Earth Sciences, 22, 253–263. Jeanin M., Garambois S., Gregorie S. and Jongmans D., 2006. Multi-configuration GPR measurements for geometrical fracture characterization in limestone cliffs (Alps). Geophysics, 71, 885-892. Jomard H., Lebourg T., Tric E., 2007. Identification of the gravitational boundary in weathered gneiss by geophysical survey: La Clapière landslide (France). Journal of Applied Geophysics 62: 47-57. Jongmans D., Hemroulle P., Demanet D., Renardy F. and Vanbrabant Y., 2000. Application of 2D electrical and seismic tomography techniques for investigating landslides. European Jou. Env. Eng. Geophysics 5, 75-89. Kearey P., Brooks M. and Hill I., 2002. An introduction to geophysical exploration, 3rd Edition. Blackwell, Oxford, 262 p.
Lapenna V., Lorenzo P., Perrone A., Piscitelli S., Rizzo E. and Sdao F., 2003. High-resolution geoelectrical tomographies in the study of the Giarrossa landslide (Potenza, Basilicata). Bull. Eng. Geol. Env., 62, 259-68. Lapenna V., Lorenzo P., Perrone A., Piscitelli S., Rizzo E. and Sdao F., 2005. 2D electrical resistivity imaging of some complex landslides in Lucanian Apennine chain, southern Italy. Geophysics, 70, B11-B18. Lebourg T., Binet S., Tric E., Jomard H. and El Bedoui S., 2005. Geophysical survey to estimate the 3D sliding surface and the 4D evolution of the water pressure on part of a deep-seated landslide. Terra Nova 17, 399-406. Mita M., Glazer M., Kaczmarzyk R., Dąbrowski M., Mita K., 2018. Case study of electrical resistivity tomography measurements used in landslides investigation, Southern Poland, Contemp. Trends.Geosci., 7(1),110-126. Malehmir A., Saleem M.U., Bastani M., 2013. High-resolution reflection seismic nvestigations of quick-clay and associated formations at a landslide scar in southwest Sweden. Journal of Applied Geophysics 92: 84-102. Marescot L., Monnet R., Chapellier D., 2008. Resistivity and induced polarization surveys for slope instability studies in the Swiss Alps. Engineering Geology 98: 18- 28. Marinescu M., Cristea P., Maruntenau C., Mezincescu M., 2017. MASW Seismic Method in Brebu Landslide Area, Romania. IOP Conference Series: Earth and Environmental Science 95 032035. Mauritsch H.J., Seiberl W., Arndt R., Romer A., Sneiderbauer K. and Sendlhofer G.P., 2000. Geophysical investigations of large landslides in the Carnic region of southern Austria. Eng. Geology 56, 373–388. Mc Cann D.M. and Forster A., 1990. Reconnaissance geophysical methods in landslide investigations. Engin. Geol. 29, 59–78. Meric O., Garambois S., Jongmans D., Wathelet M., Chatelain J.L. and Vengeon J.M., 2005. Application of geophysical methods for the investigation of the large gravitational mass movement of Séchilienne, France. Canadian Geotechnical Journal 42, 1105-1115. Meric O., Garambois S., Malet J.P, Cadet H., Gueguen P. and Jongmans D., 2007. Seismic noise-based methods for soft-rock landslide characterization. Bulletion De La Societe Geologique De France 178, 2, 137-148. Patella D., 1997. Introduction to ground surface self-potential tomography. Geophys. Prospect., 45, 653–681. Perrone A., Lapenna, V., Piscitelli S., 2014. Electrical resistivity tomography technique for landslide investigation: A review, Earth-Science Reviews 135 (2014) 65–82 Earth-Science Reviews 135, 65–82. Revil A., Pezard P. and Glover E.W.J., 1999. Streaming potential in porous media. 1, Theory of the zeta potential. J. Geophys. Res., 104, 20,021-20,031. Reynolds J.M., 1997. An introduction to applied and environmental geophysics. Wiley & Sons, Chichester, 806 p.
Roch K.H., Schwatal, B. and Bruckl E., 2006. Potentials of monitoring rock fall hazards by GPR: considering as example the results of Salzburg. Landslides, 3, 87-94. Sass O., Bell R., Glade T., 2008. Comparison of GPR, 2D-resistivity and traditional echniques for the subsurface exploration of the Öschingen landslide, Swabian Alb (Germany). Geomorphology 93: 89-103. Sharma P.V., 1997. Environmental and engineering geophysics. Cambridge Univ. Press, New York, 475 p.
Sidle, R.C. and Ochiai, H., 2006. Landslides: Processes, Prediction, and Land Use. Water Resources Monograph Series, volume 18.Washington, D.C.: American Geophysical Union. Socco V. and Jongmans D., 2004. Special issue on seismic surface waves. Near Surf. Geophys., 2, 163-258. Supper R. and Römer A., 2003. New achievements in developing a high-speed geoelectrical monitoring system for landslide monitoring. In: Proc. 9th Meeting Env. Eng. Geophys., Prague, Czech Republic. – EAGE Publications, EEGS, Houten, Paper O-004, 6 p.
Telford W.M., Geldart L.P., Sherif R.E. and Keys D.A., 1990. Applied geophysics. Cambridge Univ. Press, Cambridge,770 p.
Turnbull, W.J. and Hvorslev, M.J., 1967. Special problems in slope stability. Proceedings of the ASCE 93, (SM4), 499-528. Wisen R., Auken E. and Dahlin T., 2005. Combination of 1D laterally constrained inversion and 2D smooth inversion of resistivity data with a priori data from boreholes. Near Surf. Geophys., 3, 71-79. Mudge S.T. and Dentith M., 2014. Geophysics for the Mineral Exploration Geoscientist, Cambridge University Press, 454 pages.